A gala charity concert entitled Voices of Hope takes place next week to raise funds for young people in Galway and communities in Africa. 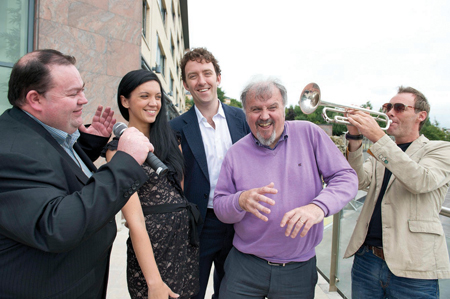 The Voices of Hope Gala Concert takes place in the Live Lounge at the Radisson Blu Hotel on Thursday September 19 and all funds raised will benefit Jigsaw Galway and Self Help Africa. Performers are Karen Coleman from The Commitments; Keith McDonald; Denise Brennan; recent contestants from the Voice of Ireland, including finalist Shannon Murphy; Clarinbridge’s John Gaughan; Aoife McLoughlin; classical singer Darragh McGann; and Sean Slattery & The Connections as the house band. “The aim of Voices of Hope is to bring together Ireland’s leading singers for one night to celebrate hope, resilience, and compassion,” said concert organiser Darragh McGann, better known as the “singing taxi driver” and Voice of Ireland contestant. All proceeds raised will go to Jigsaw Galway and Self Help Africa. Jigsaw Galway is a free and confidential support service for young people (aged 15 to 25 ) in Galway city and county. Jigsaw supports those experiencing difficulties that affect their mental health and wellbeing. Self Help Africa works with rural communities in Africa to help them improve their farms and their livelihoods. The primary focus is on assisting families and communities to grow enough food to feed themselves, to earn a sustainable living, and create sustained economic progress can be made across sub-Saharan Africa. Tickets are €20 and are available from the reception in the Radisson Blu Hotel or by calling 091 - 538300.